I really do. You might think I’m some sort of crazy lady, but having run two days in the rain this week, I’ve decided that it is absolutely refreshing to run in the rain. I would go as far to say that I would love running in torrential downpours, but who knows. Maybe I would. I’m not crazy like the hubby and didn’t run 10 miles during Tropical Storm Irene either. I bet you thought I stopped blogging, didn’t you? Getting back in the swing of school schedules for myself and Tucker has been difficult, but I think I’m getting there. The marathon plan this week was to run two 5-milers and an 8 miler, with some cross training, and my long run this weekend. The Yoga to Run group is doing their 20 miler this weekend, but I did shift my running plan a little to incorporate 2 – 20 milers so I’ll be doing 16 miles with Jess this weekend instead. Jess and I will do our 20 miler next weekend. Anyway, looking at my crazy, back-to-school schedule for the week – I knew getting an 8 miler in mid-week was not going to work, so I took advantage of having Monday off (thank you Labor Day, love you!) and ran the 8 miles then – in the rain. There were some pretty hard downpours at times and I loved every moment of it. I really did. We were actually at the in-law’s cottage in Chesterville, so I got to run on some different roads WITHOUT my iPod! There isn’t a shoulder at all, and while the traffic is fairly light, the cars/trucks do drive fairly fast. So I thought it would be best to run without the iPod. I kept my pace at 8:44/mile. Not so bad. I actually knocked 2 minutes off of my time from last week's 8 mile run. Now, those 2 – 5 milers were looking a bit tough too because I just didn’t know how to squeeze in 5 miles after school and the crazy schedule – Tuesday was soccer for Tucker, tonight was Tucker’s Open House and Thursday Ward has his Bond Brook Trail Running. Crazy! SO, I opted to just do 3 nights of 3.5 miles instead. I know it's not the same, but it's what I can handle right now. So far I’m doing well with that. Anyway, yesterday I received an incredible package in the mail from Cottage Rose. It is so cool! I tore that sucker out of the package and put it on immediately and went for a run in it. It’s a cotton t-shirt, not a tech shirt, but as the days get cooler, I will enjoy running in it or just wearing it around. Too bad I couldn’t wear it to school! So…as promised, I did say that when I got to 50 followers I would have a giveaway – here’s your chance……. What you win – 1 shirt from Cabbage Rose, an awesome Etsy shop. Follow me (mandatory) – leave me comment to tell me you follow me. Check out Cabbage Rose on Etsy and let me know which shirt you'd like in a comment. Follow me on twitter – leave me a comment to tell me. Share my contest on your blog, facebook, or twitter (an extra entry for each) – leave me a comment to let me know. The contest closes on 9/16 at midnight and I will choose a winner shortly after that! 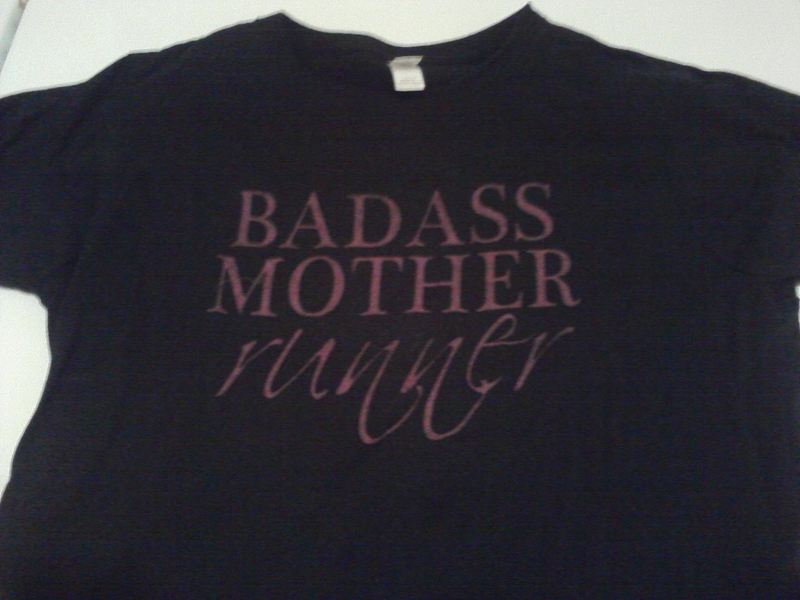 I like the Running it's what runners do shirt and the Badass Mother Runner. I like her stuff! Ooo...so exciting! You know I follow you! I LOVE the "Running it's what runners do" shirt! I share your contest on my blog! I shared your contest on facebook! I like the badass mother runner one best! So fun! Shared your giveaway on twitter! totally want the badass mother runner shirt! I like Running is what runners do! Oh, oh, me pleeeeeeze :-) I follow you on here. i like the black t-shirt with blue writing that says: "i have 26.2 reason to run"
I like 'running it's what runners do"
I like the motivational women running shirt. just found you, so will follow you now! I like the Running, It's What Runners Do shirt the best. The BADASS shirt is cute, too.